$500 below NADA Retail!, EPA 28 MPG Hwy/21 MPG City! Extra Clean, CARFAX 1-Owner, ONLY 15,946 Miles! Platinum trim. Nav System, Moonroof, Heated Leather Seats, Panoramic Roof, Aluminum Wheels, All Wheel Drive. SEE MORE! Leather Seats, Navigation, Panoramic Roof Rear Spoiler, MP3 Player, Sunroof, All Wheel Drive, Onboard Communications System, Aluminum Wheels, Privacy Glass. Nissan Platinum with Pearl White exterior and Graphite interior features a V6 Cylinder Engine with 260 HP at 6000 RPM*. Serviced here, Non-Smoker vehicle, Free Vehicle History Report, Remote Start, Just Arrived, CLEAN CARFAX. If you're looking for a 5-passenger SUV that's reliable and powerful, spacious and comfortable, fuel-efficient and well-appointed you'll like the new 2018 Nissan Murano. -KBB.com. Great Gas Mileage: 28 MPG Hwy. This Murano is priced $500 below NADA Retail. Toyota Certified, CARFAX 1-Owner, LOW MILES - 31,651! NAV, 3rd Row Seat, 4x4, Alloy Wheels, Tow Hitch, RIGID RUNNING BOARDS, RADIO: ENTUNE PREMIUM AUDIO WITH NAVI..., REMOTE ENGINE STARTER, Serviced here, CLEAN CARFAX READ MORE! 4x4, Trailer Hitch, Aluminum Wheels. Rear Spoiler, Keyless Entry, Privacy Glass, Child Safety Locks, Heated Mirrors. FABRIC-TRIMMED 50/50 SPLIT FOLD-FLAT 3RD ROW sliding 2nd row w/passenger-side 1-touch access to 3rd row and 3rd row curtain shield airbags, Trunk Carpet, REMOTE ENGINE STARTER, RADIO: ENTUNE PREMIUM AUDIO WITH NAVIGATION App Suite, Multimedia Bundle (6.1-in, high resolution touch-screen w/split screen display, AM/FM CD player, 8 speakers, auxiliary audio jack, USB 2.0 port w/iPod connectivity and control, advanced voice recognition, hands-free phone capability, phone book access and music streaming via Bluetooth wireless technology), HD radio, HD predictive traffic and Doppler weather overlay, AM/FM cache radio, Sirius XM All Access Radio and Gracenotes album cover art, Entune App Suite includes Bing, Facebook Places, iHeartRadio, MovieTickets.com, OpenTable, Pandora and Yelp; real-time info including traffic, weather, fuel prices, sports and stocks, Access to Entune services is complimentary for three years, See toyota.com/entune, RIGID RUNNING BOARDS. Serviced here, CLEAN CARFAX. This vehicle is located at Toyota South 961 Four Mile Rd Richmond KY 40475 Pricing analysis performed on 4/8/2019. Horsepower calculations based on trim engine configuration. Please confirm the accuracy of the included equipment by calling us prior to purchase. Leather Seats, Navigation, 4x4, Heated Driver Seat, Cooled Driver Seat, Back-Up Camera, Running Boards, Premium Sound System, Satellite Radio, Onboard Communications System, Trailer Hitch, Aluminum Wheels, Remote Engine Start, Dual Zone Climate Control, WiFi Hotspot. MP3 Player, iPod Input, Privacy Glass, Keyless Entry, Steering Wheel Controls. Toyota Certified, Superb Condition, CARFAX 1-Owner. SR5 trim. PRICE DROP FROM $32,690, PRICED TO MOVE $2,900 below NADA Retail! NAV, 3rd Row Seat, 4x4, Onboard Communications System, Back-Up Camera, Alloy Wheels, Tow Hitch SEE MORE! 4x4, Back-Up Camera, Onboard Communications System, Trailer Hitch, Aluminum Wheels. Rear Spoiler, Keyless Entry, Privacy Glass, Child Safety Locks, Steering Wheel Controls. FABRIC-TRIMMED 50/50 SPLIT FOLD-FLAT 3RD ROW sliding 2nd row w/passenger-side 1-touch access to 3rd row and 3rd row curtain shield airbags, Trunk Carpet, RADIO: ENTUNE PREMIUM AUDIO WITH NAVIGATION Entune Multimedia bundle (6.1 high resolution touch-screen w/split screen display, AM/FM CD player w/MP3/WMA playback capability, 8 speakers, auxiliary audio jack, USB 2.0 port w/iPod connectivity and control, advanced voice recognition, hands-free phone capability, phone book access and music streaming via Bluetooth wireless technology), Siri Eyes Free, Entune AppSuite, HD Radio, HD Radio predictive traffic and Doppler weather overlay, AM/FM cache radio, SiriusXM satellite radio w/3-month complimentary all access trial, Gracenote album cover art and integrated backup camera display w/projected path, Entune App Suite includes Destination Search, iHeartRadio, MovieTickets.com, OpenTable, Pandora, Facebook Places, Yelp and Slacker Radio; real-time. Serviced here, CLEAN CARFAX. GREAT MILES 36,677! FUEL EFFICIENT 24 MPG Hwy/18 MPG City! PREDAWN GRAY MICA exterior and BLACK interior, XLE trim. Sunroof, NAV, Heated Leather Seats, 3rd Row Seat, Rear Air, All Wheel Drive, Alloy Wheels, Power Liftgate READ MORE! Leather Seats, Third Row Seat, Navigation, Power Sunroof, All Wheel Drive, Power Liftgate, Rear Air, Heated Driver Seat, Back-Up Camera, Satellite Radio, Bluetooth, Aluminum Wheels, Keyless Start, Dual Zone Climate Control, Smart Device Integration. Rear Spoiler, MP3 Player, iPod Input, Privacy Glass, Keyless Entry. Toyota XLE with PREDAWN GRAY MICA exterior and BLACK interior features a V6 Cylinder Engine with 270 HP at 6200 RPM*. EPA 24 MPG Hwy/18 MPG City! GREAT MILES 27,013! XLE trim. Sunroof, Navigation, Heated Leather Seats, 3rd Row Seat, All Wheel Drive, Power Liftgate, TOWING RECEIVER HITCH & WIRE HARNESS, Trailer Hitch, Alloy Wheels. CLICK ME! Leather Seats, Third Row Seat, Navigation, Power Sunroof, All Wheel Drive, Power Liftgate, Rear Air, Heated Driver Seat, Back-Up Camera, Satellite Radio, Bluetooth, Aluminum Wheels, Keyless Start, Dual Zone Climate Control, Smart Device Integration. Rear Spoiler, MP3 Player, iPod Input, Privacy Glass, Keyless Entry. TOWING RECEIVER HITCH & WIRE HARNESS. Toyota XLE with BLIZZARD PEARL exterior and ASH interior features a V6 Cylinder Engine with 270 HP at 6200 RPM*. Extra Clean. EPA 28 MPG Hwy/21 MPG City! PEARL WHITE exterior and Graphite interior, SL trim. NAV, Sunroof, Heated Leather Seats, Power Liftgate, [J01] MOONROOF PACKAGE, Alloy Wheels, All Wheel Drive. AND MORE! Leather Seats, Navigation, Power Liftgate. Rear Spoiler, MP3 Player, All Wheel Drive, Aluminum Wheels, Privacy Glass, Remote Trunk Release, Keyless Entry. MOONROOF PACKAGE: Power Panoramic Moonroof. Nissan SL with PEARL WHITE exterior and Graphite interior features a V6 Cylinder Engine with 260 HP at 6000 RPM*. Serviced here, Free Vehicle History Report, Remote Start, Just Arrived, New Windshield Wipers, CLEAN CARFAX. This vehicle is located at Gates Nissan of Richmond. 4098 Atwood Dr. Richmond KY 40475 Pricing analysis performed on 4/18/2019. Horsepower calculations based on trim engine configuration. Fuel economy calculations based on original manufacturer data for trim engine configuration. Please confirm the accuracy of the included equipment by calling us prior to purchase. Toyota Certified, CARFAX 1-Owner, GREAT MILES 35,798! REDUCED FROM $31,590!, PRICED TO MOVE $2,500 below NADA Retail! Heated Seats, Navigation, Moonroof, Back-Up Camera, Satellite Radio, Bluetooth, Trailer Hitch, 4x4. SEE MORE! Navigation, Power Sunroof, 4x4, Heated Driver Seat, Back-Up Camera, Satellite Radio, Bluetooth, Trailer Hitch, Aluminum Wheels, Smart Device Integration, Heated Seats. Rear Spoiler, MP3 Player, iPod Input, Keyless Entry, Privacy Glass. PREMIUM PACKAGE W/SOFTEX SR5 Premium Package. Toyota SR5 Premium with Nautical Blue Pearl exterior and Black/Graphite interior features a V6 Cylinder Engine with 270 HP at 5600 RPM*. Serviced here, CLEAN CARFAX. Was $31,590. This 4Runner is priced $2,500 below NADA Retail. This vehicle is located at Toyota South 961 Four Mile Rd Richmond KY 40475 Pricing analysis performed on 4/17/2019. Horsepower calculations based on trim engine configuration. Please confirm the accuracy of the included equipment by calling us prior to purchase. CARFAX 1-Owner, ONLY 17,995 Miles! REDUCED FROM $33,590!, $3,300 below NADA Retail!, EPA 24 MPG Hwy/17 MPG City! Heated Seats, Remote Engine Start, Smart Device Integration, WiFi Hotspot, Onboard Communications System, 4x4 SEE MORE! 4x4, Heated Driver Seat, Back-Up Camera, Satellite Radio, Onboard Communications System, Aluminum Wheels, Remote Engine Start, Smart Device Integration, WiFi Hotspot, Heated Seats MP3 Player, iPod Input, Keyless Entry, Steering Wheel Controls, Heated Mirrors. Reduced from $33,590. This Colorado is priced $3,300 below NADA Retail. This vehicle is located at Toyota South 961 Four Mile Rd Richmond KY 40475 Pricing analysis performed on 4/17/2019. Fuel economy calculations based on original manufacturer data for trim engine configuration. Please confirm the accuracy of the included equipment by calling us prior to purchase. CARFAX 1-Owner. Nav System, Moonroof, Third Row Seat, Heated Leather Seats, Rear Air, Back-Up Camera, Aluminum Wheels, All Wheel Drive, Power Liftgate. Leather Seats, Navigation, Sunroof, All Wheel Drive, Power Liftgate, Rear Air, Heated Driver Seat, Back-Up Camera, Satellite Radio, iPod/MP3 Input, Bluetooth, CD Player, Aluminum Wheels, Keyless Start, Dual Zone A/C. Rear Spoiler, Third Row Seat, MP3 Player, Remote Trunk Release, Keyless Entry. Toyota XLE with BLIZZARD PEARL exterior and ALMOND interior features a V6 Cylinder Engine with 270 HP at 6200 RPM*. Toyota Certified, Extra Clean, ONLY 64,414 Miles! Limited trim. WAS $30,990. 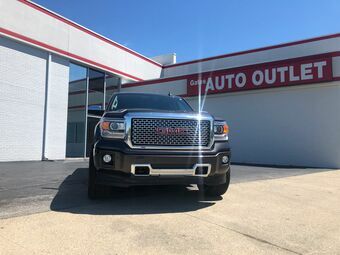 Heated/Cooled Leather Seats, Navigation, Sunroof, Back-Up Camera, Premium Sound System, 4x4, RUNNING BOARDS, Trailer Hitch, Alloy Wheels CLICK NOW! Leather Seats, Navigation, Power Sunroof, 4x4, Heated Driver Seat, Cooled Driver Seat, Back-Up Camera, Premium Sound System, Satellite Radio, Onboard Communications System, Trailer Hitch, Aluminum Wheels, Keyless Start, Dual Zone Climate Control, Heated Seats. Rear Spoiler, MP3 Player, iPod Input, Privacy Glass, Keyless Entry. RUNNING BOARDS. Toyota Limited with Classic Silver Metallic exterior and Black interior features a V6 Cylinder Engine with 270 HP at 5600 RPM*. Serviced here, No Accidents. LOW MILES - 29,991! EPA 23 MPG Hwy/18 MPG City! SR5 trim. Bluetooth, Smart Device Integration, Brake Actuated Limited Slip Differential, 4x4, Back-Up Camera, Satellite Radio. CLICK NOW! 4x4, Back-Up Camera, Satellite Radio, Bluetooth, Smart Device Integration, Brake Actuated Limited Slip Differential. MP3 Player, iPod Input, Keyless Entry, Privacy Glass, Steering Wheel Controls. Toyota SR5 with MAGNETIC GRAY METALLIC exterior and CEMENT GRAY interior features a V6 Cylinder Engine with 278 HP at 6000 RPM*. ONLY 31,771 Miles! FUEL EFFICIENT 23 MPG Hwy/18 MPG City! Bluetooth, Brake Actuated Limited Slip Differential, Smart Device Integration, Satellite Radio, ALL WEATHER FLOOR LINERS & DOOR SILL.. 4x4, Back-Up Camera READ MORE! 4x4, Back-Up Camera, Satellite Radio, Bluetooth, Brake Actuated Limited Slip Differential, Smart Device Integration. MP3 Player, iPod Input, Privacy Glass, Keyless Entry, Child Safety Locks. ALL WEATHER FLOOR LINERS & DOOR SILL PROTECTORS. Toyota SR5 with BLACK exterior and BLACK/CARAMEL interior features a V6 Cylinder Engine with 278 HP at 6000 RPM*. CARFAX 1-Owner, LOW MILES - 40,662! WAS $30,490, $200 below NADA Retail!, EPA 24 MPG Hwy/18 MPG City! XLE trim. Sunroof, Navigation, Heated Leather Seats, 3rd Row Seat, All Wheel Drive, Power Liftgate, 2ND ROW CAPTAIN CHAIRS. CLICK NOW! 2ND ROW CAPTAIN CHAIRS folding side table w/two cupholders. Toyota XLE with BLIZZARD PEARL exterior and BLACK interior features a V6 Cylinder Engine with 270 HP at 6200 RPM*. Was $30,490. This Highlander is priced $200 below NADA Retail.